Tim Gilbert flies the Cabri G2. How hard is flying the Guimbal Cabri G2 for the first time, after a flying lifetime in Robinsons? Some time in the late 1980s, I first came across the Robinson R22. It really spoke to me. Compared to the slow, heavy, old-tech trainers available up till then, it seemed modern, sleek, innovative, affordable, and generally appealing to someone like me thinking of learning to fly a helicopter. I trained on one, owned several, and upgraded to the R44 as soon as it arrived. I became a fan of the Robinson brand. My loyalty wasn’t blind; I kept an eye on the accident record and the safety notices, always looking for any kind of tipping point that made me truly uncomfortable, and which might outweigh the outstanding qualities of the machines as private owner propositions. And, despite everything that keyboard warriors on the internet throw at Robinsons, I’m still very happy to fly them and recommend them. After a long time being tempted, I flew the Guimbal Cabri G2 helicopter the other day. Since its launch I’ve been impressed by the look of the Cabri. I had a few minutes sitting in one at a Helicentre open day soon after the type’s arrival at Leicester. It looks like a helicopter designed on a Mac. Modern materials, finishes, and engineering are put together in a way that appeals to the student or potential customer who arrives at the airport car park in a perfectly regular business saloon or SUV. If you study this customer’s face when showing him/her round an R22, you can see flickers of mild disbelief as they adjust to the slightly home-built-with-tin-snips-and-a-pop-riveter consumer experience. Nothing else in their world is that combination of expensive and unrefined. By contrast, the Cabri today speaks to them in a way that R22 first spoke to me. Beyond its appealing looks, from first seeing the Cabri I had a sense that someone had looked around an R22 and made a list of all of its drawbacks as a training machine, and had set about fixing every one. Of course, its design origins as a military drone never brought into service slightly belie that notion, but nevertheless the list is impressive. You can’t bump the mast. You don’t have to take split-second care (with RRPM) when demonstrating autorotations. You don’t have to be unfeasibly thin to manage a full hour’s dual lesson in it with a normally nourished customer. It’s wide enough and well enough ventilated in the cabin for comfort. It’s properly crashworthy with modern seating and bladder tanks as standard. It’s got an automated carb heat system that works and feeds back good information to the pilot. It will cruise at 100 knots, and for long enough to make it a viable competitor as a private owner’s machine to the R44, unless you really need those two extra seats on a very regular basis. It’s quieter for your neighbours. And so on. Impressive also is the enthusiasm of Cabri owners and operators. It’s as if they have come home to a place they always wanted to be, and they want you to join them there. So what’s it like to fly? I only had an hour in it, so I can only give my first impressions, but I must say I loved it. It felt properly safe, well-engineered and balanced. I noticed that I wasn’t spending much time processing particular noises and vibrations to check they weren’t a threat. Arriving at Elstree I had had one real anxiety; this was the first helicopter I’d flown with the blades going round clockwise. How would I cope? I won’t say the adjustment was completely easy. I actually said to my instructor Paul, at one point in the flight, that it was many decades since I’d been so bad at flying a helicopter. Actually quite a good experience for any instructor, to be reminded what that feels like. I had wondered if I would sit in the left seat as the student, to accommodate the clockwise MR direction, but Paul had set me straight on that during the briefing, in response to my question about it. I suspect the fuel being all on the port side helps with that. The start-up and get ready process is easy enough, with just the usual blur of not knowing where to look as the type is unfamiliar. Another reminder of what it’s like to be a student. Paul lifts and taxys away from the fuel for me. I follow through on the controls as we wait for our moment to cross the runway and climb away. I notice a lot of right pedal, and very little input required with the stick, both in the hover and in the accelerate and climb away. I am used to them being, so eventually I stop trying, and focus on the world around me for clues. The string in the middle of the uninterrupted bubble of Perspex reminds me constantly that I’m not quite getting the transition to up-lever-right-pedal quite right, but I do my best, using my conscious brain. We make a quick tour of Hertfordshire, with controlled airspace immediately above, to the right and the left of us. Once it’s trimmed with the electric trimmer (trim it once and forget it until you’re on the approach) it feels like it flies itself. 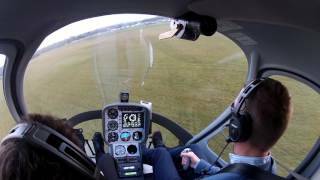 That feeling in the R22 that if you or (more worryingly) the student let go of the stick it’s a total disaster within seconds is almost completely absent. The stick centres itself quite aggressively, needing quite deliberate inputs to move it away from straight and level. We try an autorotation. Although I’m behind the machine, I manage the correct pedal input, and settle into a gentle 180 turn into wind while losing 1500ft. So undramatic. I haven’t quite got my head round the logarithmic scale on the RRPM gauge, but I can see the massive, to a Robinson pilot, acceptable range of rotor speed available, clearly marked on the glass display. We don’t get anywhere too fast or too slow with RRPM, though admittedly I’m being pretty gentle with it. Back to Elstree, and the approach and descent are easy enough. I focus on the flare. I have decided that I want to arrive in the hover still with some speed to kill, to make use of the vertical fin. So it’s just like the R22; keep the translational lift going for as long as possible and preferably until you’re in ground effect. This also has the advantage of minimising torque required. And be prepared to press right pedal, and lots of it, as you raise the lever to arrest the descent. It’s easier than I’d anticipated. Like most things that get talked up in aviation. What was more of a shock was trying to hover! Everything I’ve previously flown has been fitted with a teetering head (or a very long mast in the case of the 280c) so hovering is a pendulous affair. This gives the pilot a relatively easy ride when hovering, because the fuselage is moving around in a way that is amplified by being like the weight on the end of the pendulum. It gives you lots of notice that a tiny movement has occurred up there at the rotor head. You react imperceptibly, and things straighten themselves out in good time. With the Cabri there’s barely any mast, and there’s certainly no pendulum effect. The MR disk tilts, and takes you and the fuselage with it. Instead of pendulous, it’s just plain jerky. Well, with me flying it, at any rate. I tried the usual “less is more” thing that usually pays in helicopters, and things settled down a lot, but it took be a few minutes to get to the point where I was happy to try to land it. Taxying back to the pumps, I realised that I really would have to do a type rating, and ten more hours to enable me to instruct on it. It was that good. Would everyone think the same? Well it’s a bit more expensive per hour than the R22, so if price is your overwhelmingly deciding factor, then that settles that. So if you’re aiming for CPL(H) on a budget, for example, you’d probably need some persuasion to spend the extra. Some people claim it’s easier, therefore quicker, to learn on. I’ll report back on that as I fly it more. If your nearest/most convenient flight school only has Robinsons, and has an excellent reputation, then again, that’s quite compelling. If you’re definitely heading for the R44/R66 or even a JetRanger, the R22 is a sensible training choice as the transition will be safer and easier. If you are considering buying an R44 at some stage, check out the Cabri’s endurance, speed and payload as a viable alternative private owner option. If you’re too tall or too heavy for the R22 (over about 90kg), then the Cabri is a good choice if you don’t want to train in an R44. 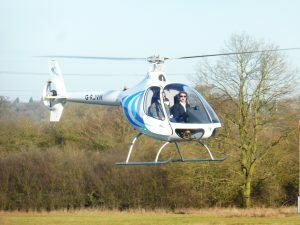 If you’re heading for an EC120 or similar, the Cabri is a no brainer. If the consumer experience of what you fly is important to you, and for many it is nowadays, the Cabri will talk to you very eloquently. Similarly, the Cabri’s modern safety features beat the R22 hands down. The only other observation I would add is, if you’re a PPL(H) and haven’t got many hours in your logbook, I can imagine that the change of MR direction will take quite a lot of training and practice to master safely. Possibly more than the type rating minimum. (Thanks to Paul at http://www.flyingpighelicopters.co.uk for a safe and enjoyable introduction to the type).